MATERIAL OF TERMINAL = ALUMINUM ALLOY GRADE 4600 CONFORMING IS 617-1994 (LM-6). MATERIAL OF NUT, BOLT, PLAIN WASHER – MILD STEEL HOT DIP GALVANISED. SPRING WASHER SPRING STEEL ELECTRO GALVANISED. 1) PLEASE ADD SUFFIX H1, H2, H3 AS REQUIRED FOR DIAMETER OF 4 HOLES H DIA. IN THE TERMINAL FOR e.g. CATALOG NO. 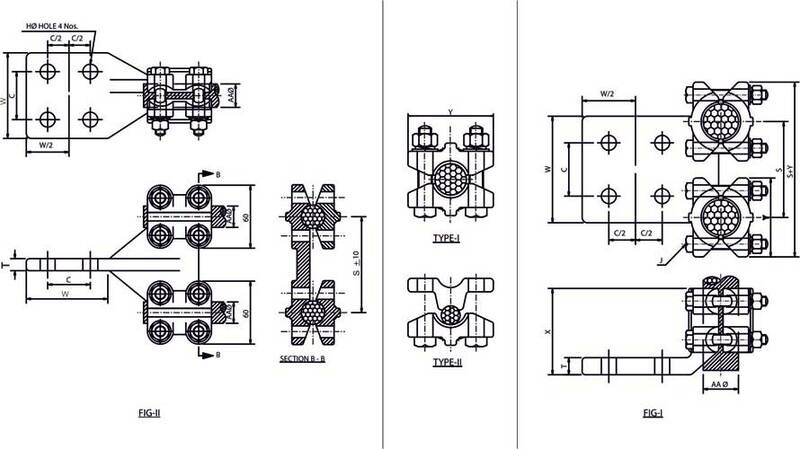 OF TERMINAL FOR CONDUCTOR DIA.10.0 TO 16.0mm. WITH 14mm. HOLE DIA IS A2CFL-6_H2. 2) PLEASE ADD SUFFIX C1,C2—-C9 AS REQUIRED FOR CENTRE TO CENTRE DISTANCE OF 4 HOLE IN THE TERMINAL PAD. IN CASE OF CUSTOM MADE PLEASE SPECIFY NUMERICAL VALUE FOR e.g. CATALOG NO. OF TERMINAL FOR CONDUCTOR DIA. 10.0 TO 16.0mm. WITH 14mm HOLE DIA. HOLE TO HOLE CENTRE 50mm. IS A2CFL-6_H2_C5. CATALOG NO. OF TERMINAL FOR CONDUCTOR DIA. 10.0 TO 16.0mm. WITH 14mm HOLE DIA. HOLE TO HOLE CENTRE 42mm. IS A2CFL-6_H2_42. 3) PLEASE ADD SUFFIX W1, –W3 AS REQUIRED FOR WIDTH OF TERMINAL. e.g. CATALOG NO. OF TERMINAL FOR CONDUCTOR DIA. 10.0 TO 16.0 mm. WITH 14mm. HOLE DIA. HOLE TO HOLE CENTRE 50mm.TERMINAL WIDTH 80mm. IS A2CFL-6_H2_C5_W1. 4) VALUES IN THE CATALOG IS SUITABLE FOR W=80mm. VALUES WILL DIFFER IF W CHANGES. 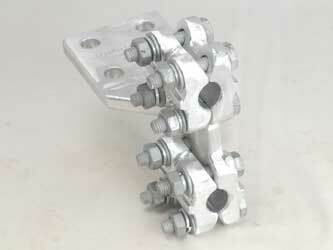 5)PLEASE ADD SUFFIX SS FOR CLAMPS WITH STAINLESS STEEL NUT BOLTS e.g. CATALOG NO. OF TERIMINAL FOR COUNDUCTOR DIA.10.0 TO 16.0mm. WITH 14mm. HOLE DIA. HOLE TO HOLE CENTER 50mm. TERMINAL WIDTH 80mm. WITH STAINLESS STEEL NUT BOLTS IS A2CFL-6_H2_C5_W1_SS. 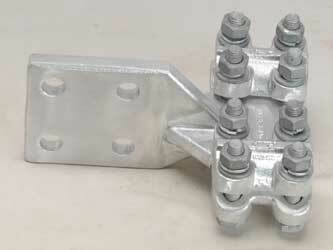 6)PAD MOUNTING HARDWARE IS OBTAINED FROM CATALOG TYPES EHBG, EHNG, EHWG FOR GALVANISED SCREWING HARDWARES. AND EHBS, EHNS, EHCNS, EHFS, EHWS FOR STAINLESS STEEL SCREWING HARDWARES.